Below are the complete details of the Junior Clerk jobs in Cooperative Societies in Peshawar. Skills Required for Job: Candidates must have Good Communication Skills. Good Team Working Skills. Projects such as gathering information by phone, letter, email or in person. Research for projects of your manager Recording and updating databases. Photocopying and scanning documents. Sorting and handing out post. Supporting the reception desk. 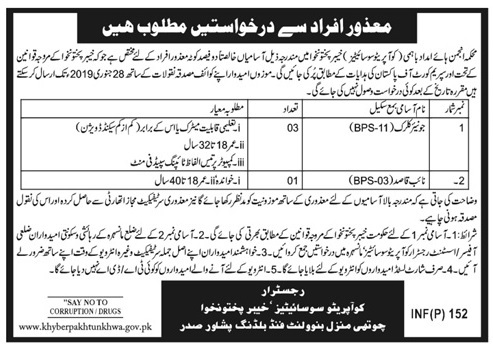 Qualification: Cooperative Societies Peshawar Jobs For Junior Clerk must be matric pass certificate with minimum experience in relevant field its a permanent based jobs, only male can apply for this post the last date of submission application is 28 January 2019. 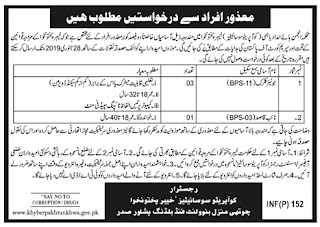 Junior Clerk jobs in Cooperative Societies Peshawar, in Pakistan published on Paperpk.com from newspaper on January 12,2019. Job seekers who are already working as Admin Officer, Receptionist , Clerk,Computer Operator, Call Operator,Front Desk Officer , can also apply for post of Junior Clerk.